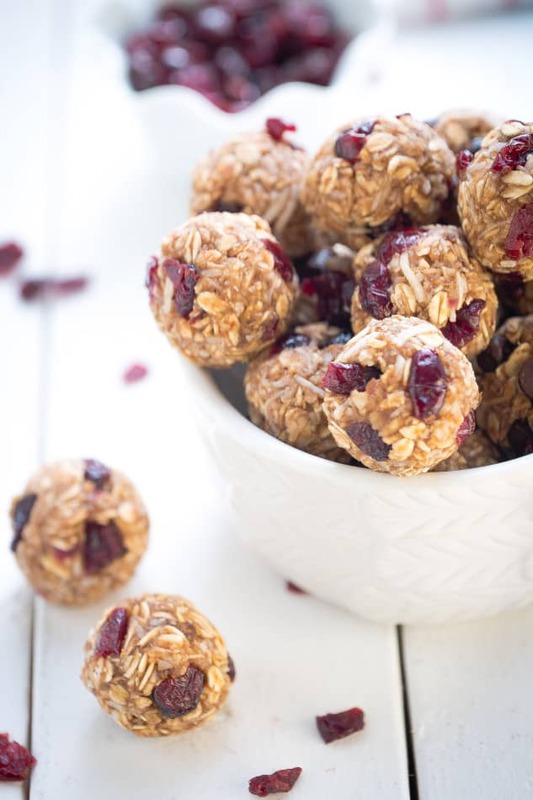 No Bake Cranberry Energy Bites with Coconut make the perfect healthy grab & go snack. Best of all, easy to make with just 7 ingredients with video! Gluten free, dairy free & refined sugar free. Plus Video! January is my favorite time to create recipes because despite all the desserts I share here, healthy recipes like these salads, smoothies, are what I turn to most. 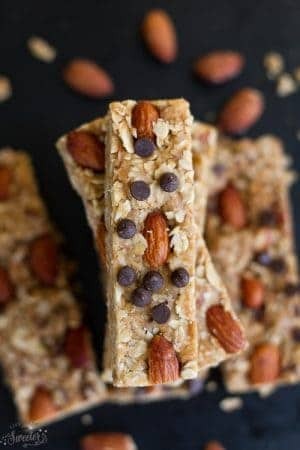 And for healthy snack options, I love making energy bites and granola bars at the beginning of the week to keep on hand for myself and the kiddos. 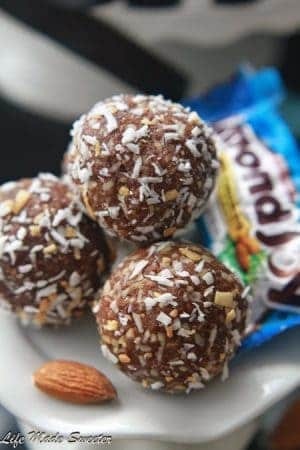 These No Bake Cranberry Energy Bites with Coconut clock in at just 135 calories per bite and are so simple to make! You can easily customize them by swapping out the ingredients with what you like or have on hand. 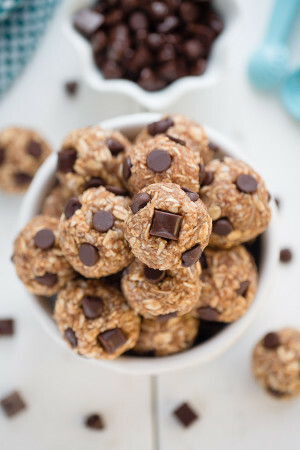 Best of all, they’re completely no bake and perfect for before or after a workout. I used gluten free oats, unsweetened shredded coconut, flax seeds and alternate between almond butter and peanut butter. You can even use your favorite nut-free seed butter as well. 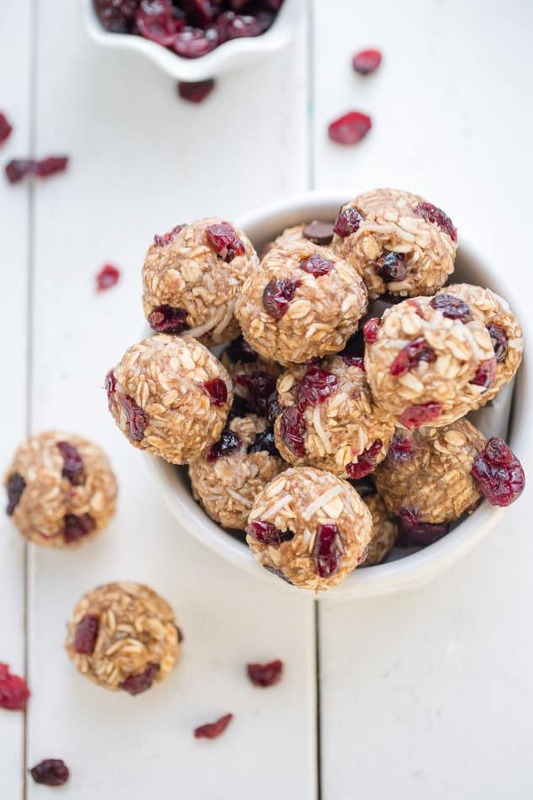 What I love about these No Bake Cranberry Energy Bites is that they are refined sugar free as well. 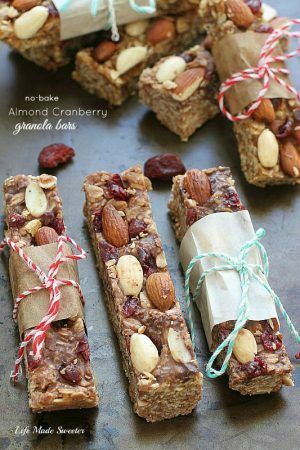 Instead, they’re sweetened with a ripened banana, a little touch of honey and dried organic cranberries. 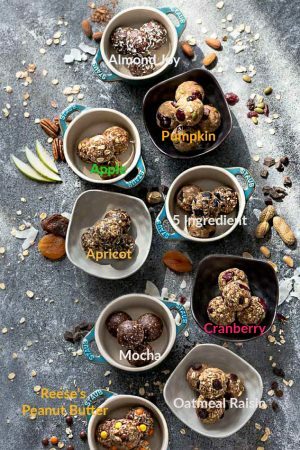 For sugar free bites, leave out the honey and swap out the cranberries for nuts instead! 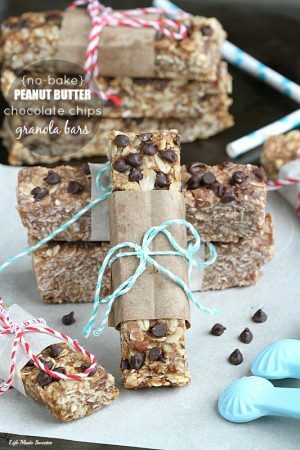 They make a great snack for toddlers and kids and they’ll have fun helping you make them too. We love making a double batch and enjoying them straight from the fridge when we need a quick pick me up. swap out the cranberries for nuts or cacao nibs if you like – cashews or almonds would be great! 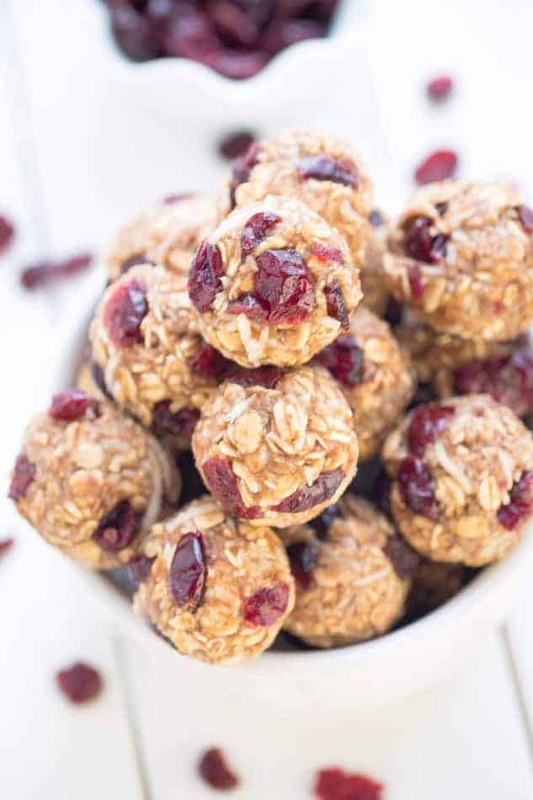 No Bake Cranberry Energy Bites make a fun and easy snack for after workouts or school lunchboxes. Only 7 ingredients and you can use sun butter or pumpkin seed butter for a nut-free version. In a large bowl, mash the banana with a fork. Stir in heated nut/seed butter and honey and mix until smooth. Add shredded coconut, oats and mix until well combined. Add optional add-ins if desired. Fold in cranberries. Wet hands slightly and form dough tightly into 1" - 1.5" balls. Or, if dough doesn't stick together place dough in the fridge for 30 minutes prior to forming dough balls so it's easier to handle. Press additional cranberries evenly around dough, if desired.